My Grooming Advice: My essential back-to-uni beauty products: Definitely Klorane Dry Shampoo for all of those mornings I woke up late – I relied far too much on hats to hide my bad hair days. Investing in one effective multi-purpose skincare and haircare product like the Nuxe Huile Prodigieuse would have been far more cost efficient than spending my pennies on lots of different skin moisturisers and hair products. My Grooming Advice: Always carry a comb like the Mason Pearson Tail Comb in your bag, and hairspray and gel are a must for nights out. They were essential for me in uni as I needed to groom my long locks!! My Grooming Advice: My essential back-to-uni beauty products: Micellar Waters are a must. If you’re feeling too lazy (or too drunk) to cleanse properly these waters are a god-send. Simply splash on some cotton wool, and wipe off the dirt and make-up. Also, keep a good lipbalm like Jack Black Intense Therapy on you at all times – everyone needs one! Your lips work extra hard at uni, whether chatting, drinking or sharing the odd kiss! My Grooming Advice: Suntan lotion for those long ‘revision’ sessions in the park. Roll on deodorant on presentation days or for lectures with lecturers who loved asking lots of questions. Some decent shaving gel like the Lab Series Comfort Shave Gel – used to use it sparingly to save money! 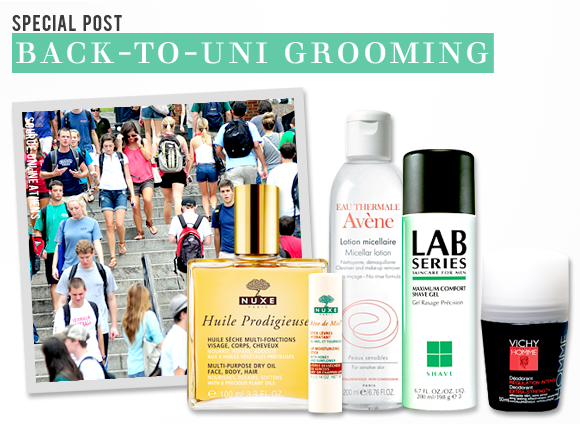 My Grooming Advice: Whilst at university to make rushing to that 9am lecture so much easier, I would never be without my hair wax as I could store one in my bag at all times. The other essential item in my university survival kit was Hugo Boss Boss Bottled Shower Gel. When showering in the mornings it was a really good shower gel but reminded me of being at home too! My Grooming Advice: Eyeliner and concealer – even if I didn’t have time to do a whole face of make up in the morning, these two made the most difference in how I looked, especially after a late night! Also the Nuxe Reve de Miel Lip Moisturising Stick, because it’s autumn so you have to take care of your lips! This entry was posted on Wednesday, September 19th, 2012 at 9:00 am and is filed under Bath & Shower, Make-up, Men, Skincare, Special Post. You can follow any responses to this entry through the RSS 2.0 feed. You can skip to the end and leave a response. Pinging is currently not allowed. Great article, uni is an awesome experience and gives everybody the chance to grow up and become independent! Out of all the advice you’ve given, which is the one that students will appreciate the most (in your opinion) ?